She has released three CDs including Telemann Methodical Sonatas, Vol. 1, and Short Concert Pieces for Flute and Piano and Andersen Etudes, opus 15. Flute Talk magazine recommends her Andersen CD, writing, “Hopkins plays these virtuoso etudes with taste and a technical ease that many students work for years to never achieve.” The Flute Network praised her Telemann recording as, “full, rich, and highly musical,” and the best selling Short Concert Pieces disc was partly funded by a grant from The Hartt School Community Division. 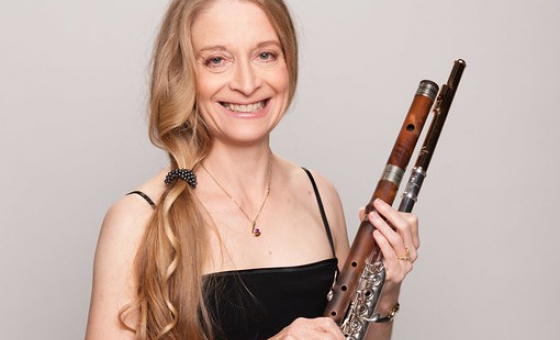 A cousin of nineteenth century Connecticut flute maker Asa Hopkins, Barbara is very interested in early flutes and music. She has acquired several flutes by Asa Hopkins, and has had them restored to playing condition. She founded The Rosewood Chamber Ensemble with guitarist Judy Handler, which specializes in concerts of early music performed on period instruments. The Greater Boston Flute Association Gazette wrote of their Boston concert, “The pieces were played with style and joy, resulting in a captivating performance.” Their first CD, Songs and Dances of Early America, was partly funded by a grant from the University of Connecticut School of Fine Arts. Barbara was first prize winner in the National Flute Association Orchestral Audition Competition, has been a top prize winner in the New York Flute Club Young Artist Competition, and was awarded a fellowship to Tanglewood Music Center, where she had the honor of playing principal flute under Leonard Bernstein. More information about Barbara is available at www.BarbaraHopkins.com. I have 25 years of teaching experience at all levels, including Hartt Community Division, University of Connecticut, Stony Brook University, and Marywood University. My teaching emphasizes developing solid musicianship, technique, and problem solving skills in a positive and supportive atmosphere. My students have won competitions sponsored by the Music Teachers National Association, National Flute Association, Greater Boston Flute Association, the University of Connecticut, and the Connecticut Music Educators Association; many are successfully teaching in the public schools. I work with students of all ages and levels, and am available for everything from regular lessons to being an "extra pair of ears" before an audition; I teach flute, piccolo, and Baroque flute. Enjoy your lessons and feel that you are in a supportive atmosphere. Are becoming a good musician, and play with good phrasing and expression. Play with proper technique, hand position, tone, and rhythm. Learn practice techniques and problem solving skills which you can apply to other areas of your life. Set musical goals which we can work on together. Play a wide variety of repertoire.